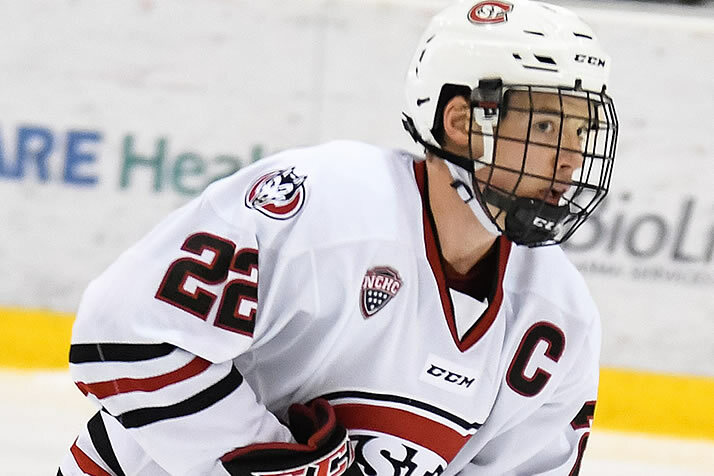 Notes: Schuldt Back for More - College Hockey, Inc.
Third-year captain has No. 1 St. Cloud State seeking new heights. Jimmy Schuldt ranks second among active defensemen with 102 career points. Freshmen fuel Sacred Heart – A three-point weekend against Air Force has Sacred Heart inching toward .500 in Atlantic Hockey despite leaning heavily on freshmen and sophomores. The Pioneers' top scorer is freshman Austin Magera (Suwanee, Ga./Lincoln-USHL), who had a hand in four of the team's five goals last weekend. At the other end of the ice, rookie goalie Josh Benson (Stillwater, Minn./Fairbanks-NAHL) has made 10 straight starts and allowed two goals or fewer in four in a row. Summit meeting in WCHA – The WCHA's top team (Minnesota State) visits its hottest team (Northern Michigan) in the conference's marquee series this weekend. It's a matchup that features the conference's top offense and power play vs. its top defense and penalty kill. Eight NCAA alumni representing six schools are participating in this weekend's NHL All-Star festivities in San Jose … 32 players have a hat trick this season; no one has two to this point … Goal of the weekend? A Minnesota State student made $30,000 on an amazing shot from the far blue line in an intermission promotion.